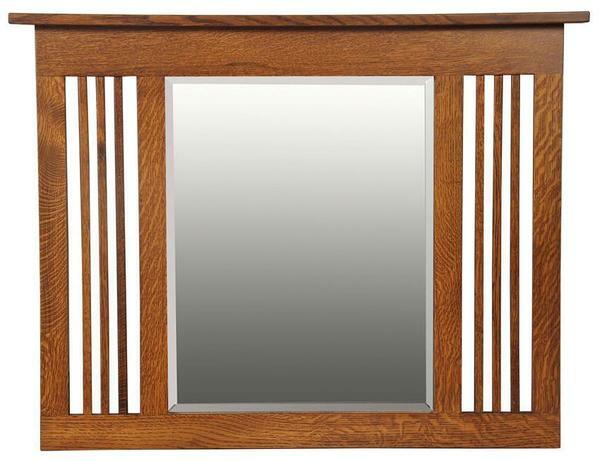 Framed in solid hardwood, with a quaint slatted design inspired by the Arts and Crafts era furniture movement, our handcrafted Upright Landmark Mission Mirror will look great on any wall in the home. The large frame is available in three different hardwood options, from the standard Oak, to Quarter Sawn White Oak as shown, or the ever popular Cherry wood - each one with their own stain to bring out the brilliance of the natural grain in the wood. Between the large vertical posts that frame the mirror, simple Mission slats promote uniformity and simplicity, allowing easy incorporation into any type of decor. The beveled edge mirror promotes rigidity and allows you to see you reflection and ensure you're looking great, anytime you pass by. Customize on for any room you choose. 40" x 2.25" x 31"
*Custom Dimensions Available - Please Call for a Free Quote. *Additional Stains Are Available - Please Call to Inquire.